You’ll never be prepared for back surgery for your pup, no matter when it happens. This post is really about what will prepare you for the aftermath of dog back surgery. It will always take you by surprise, and is often seen as the last resort when it isn’t triggered by a traumatic event. There are little resources out there, so this post is meant to assist in the long journey afterwards. In October 2016, Hambone had an incredible accident which caused him to have emergency back surgery. He incurred 3 acute herniated discs, as diagnosed by the surgeon, which were then aggravated by the fall. I had no idea that he was in any sort of back pain, other than he was becoming more stiff. We thought it was arthritis or just simply aging. At 15 years old, Hambone was definitely slowing down, having more accidents, also peeing around the house more. Low and behold, his accident had uncovered a few things for us. For one, frequent urination and accidents are a classic symptom of herniated discs. Wow. He was in daily pain, lowering his activity and losing motivation to walk about. I really didn’t notice the little things, like his ears were not perky, like in the photo below. Also, Hambone also began to slip on the wood floors more, causing him to be in discomfort. He’s surgery was successful, with some major complications with alleged sepsis (that will be another story). With the awesome support of our vet, Dr Andrew Streiber, we were able to provide Hambone with home care, beginning his and our journey into post back surgery adventures. Number 1: It is not going to be easy. I cannot lie, but taking care of a disabled dog is very intense, especially when you have no idea what it takes to be on call almost 24 hours. Number 2: It is going to be dirty. More likely than not, your dog will not have the use of his legs, and will need to be carried to pee and poop. No matter how much you try, you cannot predict when they need to go, so it was just a matter of realizing that they will go on themselves. This will happen multiple times a day. So really, cleaning is a must. Number 3: It strengthens your bond with your furbaby. It was quite rewarding to be able to care for Hambone in the state he was in. I never really understood the limits of my love for this guy, but it grew. He is a gem, a joy and a rainbow in the sky! Supplies: I have compiled a list of supplies to prepare you for your routine. After trial and a lot of error, these supplies were essential to make my life easier! No joke. 4 changes of beach towels: I used these rolled up to place around the perimeter of the inside of the pen to have soft spots and to catch poops. Also, I noticed that if Hambone peed or pooped, he would try to move to the side and not sit in it. Trash can: I kept a spare outside for poop and pee. Instead of getting a bag to place dirty wipes in while getting your hands and arms in the way, I just grabbed the can and threw stuff in it. This may seem pretty obvious but having a can that you place outside with smelly wipes was very helpful. Cheap trash bags: You will go through a lot of bags; therefore, get the office size 13 gallon ones. Mild detergent: With hot water, mild detergent helps to clean without perfumes and won’t itch your dog. Believe me, you will be washing a lot of dirty linen. Place the soft playpen in an easy to get to spot. I put him in our bedroom, basically moving my office in here, too. Remember, this is going to be a time for your extreme patience. Back surgery is extremely serious, and thus, should not be taken lightly ever. It will change everyday, and will not be perfect. Your dog will be constipated for a few days. And suddenly, by surprise, it will all blast out, in the pen, on the bed, when you least expect it. Also, don’t forget to follow us on all the social media sites! Search Three Corgis on Snapchat. On YouTube www.youtube.com/andthreecorgis and Instagram @threecorgis. We are on Twitter (until the account gets suspended). Bless you! Your little boy is fortunate to have such a loving owner. 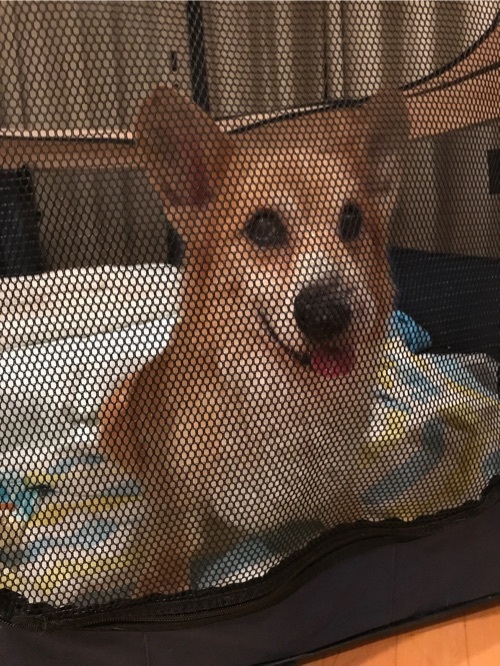 My corgi is getting surgery today. I just wanted to thank you for all the information you have posted. I will probably reach out for some advice since I want to make sure I give my fur friend the best of care. Hi, how did the surgery go? what is your instagram?